SEPTEMBER 6, 2018 – Today Metallica commemorate the 30th anniversary of the release of their breakthrough fourth album …And Justice For All with the announcement of its definitive reissue, out November 2nd on the band’s own Blackened Recordings. 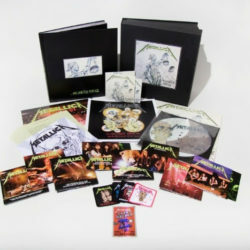 The …And Justice For All reissue will be available physically as a Standard Double 180 gram LP, Standard CD, 3 CD Expanded Edition, Cassette, Limited Edition Deluxe Box Set and digitally as a Standard album (available to stream and download), an Expanded Edition (available for download only), and a Digital Deluxe Box Set (available for streaming and download). The Expanded Edition will include previously unreleased demos, rough mixes, previously unreleased live tracks, and an expanded booklet of never-before-seen Ross Halfin photos. The one-pressing-only Limited Edition Deluxe Box Set will include the remastered double 180g LP, a “One” picture disc, 3 LPs featuring their iconic performance from Seattle in 1989 remixed by Greg Fidelman, 11 CDs, 4 DVDs, a set of four patches, a Pushead print, a tour laminate, lyric sheets, a download card for all material in the set, and a deluxe 120-page book with never-before-seen photos and never-before told stories from the people who were there. Click HERE to watch Metallica guitarist Kirk Hammett unbox the reissue. …And Justice For All was originally released—despite what the internet might tell you— September 7th, 1988, on Elektra Records. Certified 8x Platinum in the United States, …And Justice For All marked a series of firsts for Metallica: The first full length Metallica recording to feature bassist Jason Newsted, the first Metallica album to crack the U.S. Top 10 where it peaked at #6, the band’s first video and top 40 single (“One”), their debut performance on the Grammy Awards, as well as their first Grammy loss (Best Hard Rock/Metal Performance Vocal or Instrumental for …And Justice for All), and first Grammy win (Best Metal Performance for “One”). It also received more widespread critical acclaim than any of its predecessors, with Rolling Stone hailing the album as “a marvel of precisely channeled aggression,” Spin calling it “a gem of a double record,” and ultimately placing in the Village Voice annual Pazz & Jop critics poll of the year’s best reviewed albums. LOS ANGELES, CA (August 29, 2014) – Soaring past the $500 million mark at the global box office, DreamWorks Animation’s HOW TO TRAIN YOUR DRAGON 2 is not only one of the best reviewed films of the year, but also 2014’s highest grossing animated film to-date and one of the top ten grossing films of the year in any genre.The thrilling second chapter of the epic HOW TO TRAIN YOUR DRAGON trilogy returns to the fantastical world of the heroic Viking Hiccup and his faithful dragon Toothless. The inseparable duo must protect the peace and save the future of men and dragons from the power-hungry Drago when Twentieth Century Fox Home Entertainment releases DreamWorks Animation’s critically acclaimed HOW TO TRAIN YOUR DRAGON 2 on Digital HD October 21 and on Blu-ray™ and DVD November 11. HOW TO TRAIN YOUR DRAGON 2, the next chapter to the Academy Award® nominated film released in 2010, is “sensational…an instant animated classic,” proclaims Access Hollywood. 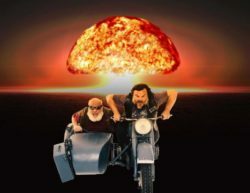 A hit with audiences and critics alike, the film received an outstanding audience reaction with a coveted “A” CinemaScore® and certified 92% fresh on RottenTomatoes.com. Variety’s Peter Debruge declares the film is “Braver than ‘Brave,’ more fun than ‘Frozen’…Dragon delivers.” It’s a must-own title for the whole family! Fans will get even more excitement, adventure and, of course, more dragons when DreamWorks Animation releases DRAGONS: DAWN OF THE DRAGON RACERS, an all-new animated adventure featuring the original voice cast. A hunt for lost sheep soon turns into a high-flying sprint in the all-new epic adventure as Hiccup and friends battle to become the first Dragon Racing Champion of Berk! DRAGONS: DAWN OF THE DRAGON RACERS will be available exclusively on the Blu-ray™ combo pack, DVD double pack and Digital HD. The all-star film talent features Jay Baruchel (This Is The End), two-time Academy Award® winner Cate Blanchett (Blue Jasmine), Gerard Butler (Olympus Has Fallen), Craig Ferguson (“The Late Late Show with Craig Ferguson”), America Ferrera (“Ugly Betty”), Academy Award® nominee Jonah Hill (The Wolf of Wall Street), Christopher Mintz-Plasse (Neighbors), T.J. Miller (“Silicon Valley”) and Kristen Wiig (Bridesmaids). The film also adds the voice talent of Academy Award® nominee Djimon Hounsou (Blood Diamond) and Kit Harington (“Game of Thrones”). The Blu-ray™, DVD and Digital HD feature hours of bonus materials that explore the world of dragons and more. Furthermore, the Blu-ray™ and Digital HD contain four exclusive featurettes, deleted scenes and a 60-minute behind-the-scenes documentary about the making of the film, shot and created by the film’s writer and director Dean DeBlois. Fishleg’s Dragon Stats – How much do you know about your favorite dragons? Explore the Dragon 2 Guide and learn more about your favorite fire-breathing friends! Drago’s War Machines – Gobber the Belch narrates this inside look at the fierce creatures and “high-tech” weapons used by Drago to expand his growing dragon army. Berk’s Dragon World – Explore the massive stable created to house the dragons of Berk, along with other changes made on the island to promote harmonious living. Hiccup’s Inventions in Flight – Learn the secrets of how Hiccup and Toothless work together to form the ultimate high-flying team in this fascinating interactive tour. Deleted Scenes — The awesome adventure continues with telling deleted and extended scenes, including action-packed footage you couldn’t see in theaters! Dragon Races – Catch the thrilling aerial action and exciting play-by-play commentary as you cheer on your favorite riders in a spectacular dragon race!